So in preparation for Ravello Bloggers Day #2 tomorrow I thought I would write up a quick blog post and its crazy to think I can do this 11,582m up in the clouds, ironically what tomorrow is all about. There is good reason why I selected the picture for my post and that is the clouds and landscape are amazing on our planet (as I glanced out the window writing this) and the same can be said out the technology too but as engineers,architects & even humans do we even stop to marvel in either of their beauties? Before I waffle I have to thank John, Kat & Amy along with the rest of their team for letting be be a delegate and having this great opportunity! I feel rather honoured to be able to do this and to be in a room full of great minds! I know first-hand from this week I have already experienced in my new role asking different questions than I usually would. How does this scale, can I do this as code or even infrastructure as code even down to how can I back that state up or even its residing data. Much like my last point we expect data everywhere now and we want easy access no VPNs or multiple credentials and let’s be fair AD domains are still the easiest single sign on for users but how do we extend all our traditional services to our users. My one prime example is a file server as this seems to have come up several times, yes we could implement things like Microsoft Teams/OneDrive or Citrix ShareFile but you will still get users that will want their home folder and their drive letters no matter how hard you try to escape this for at least a few years yet. I know some of this is business process but then what about our apps some of these just aren’t going to change overnight and use storage such as S3. I think even if I wanted to deploy this in the cloud even somewhat traditionally I would certainly have more than one cloud and then have them connected in some form. Then the question is how well are my apps going to run up there or does this cause a licensing nightmare. Again, I am still speaking with some vendors now and they still have a server client approach with HTML or web based on the way. Does that then mean I need to push my clients to the cloud or just an element and deliver this as a seamless remote application with RDS, Citrix or VMware Horizon. I know myself along with the company want to adopt a cloud first approach but are we able to tackle all of our day to day challenges yet or do we just have to think cleverly. I can only speak for myself, but I am truly excited to see what the team have achieved over the last year of somethings I may have missed. I know I will certainly be digging more into the lift and shift as this is a great way to cuddle our legacy apps and maybe even edge cases like SAP or JAVA apps. It would also be great to get a better understanding of how we can now back up their bare metal offerings and if any further hypervisors may be officially support. I know have seen some great VMware and Nutanix posts out there but it would be great to see what they think of this. A great DIY custom albeit not officially supported VMware cloud maybe? The first biggest tip I can give is forget anything 5.5! I went in the first time and after reflection speaking with James I put down way to many answers as 5.5 and not 5.0. Remember this is a 5.0 exam at the time of writing and not 5.5. A few of my thoughts on the exam and courseware though for a second is I think it’s great especially for people like me trying to move from technical to architecture. The depth of which it covers the hypervisor such as Zeus and Medusa so you have a true understanding on how things talk and what they are protecting when you are building your system is outstanding. 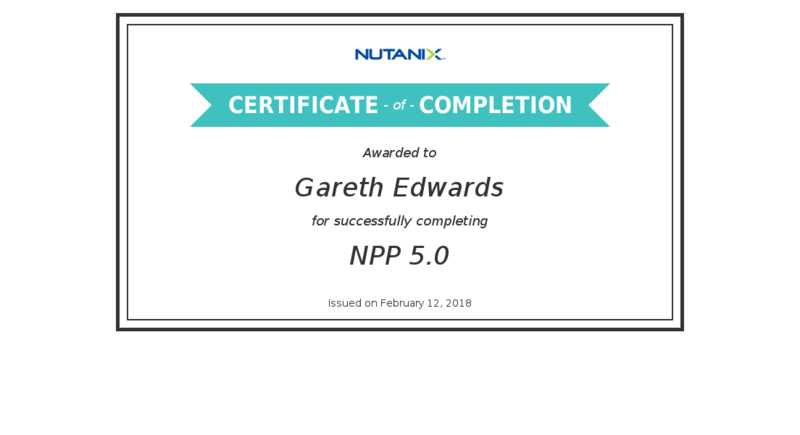 So what does that mean next for me… Well its a blog post in its own right but after a chat with James and am certainly thinking of trying to set a goal of passing my NPX. Once I get on this journey I know this will spawn a whole series of posts not just one but that’s for another day so watch out! First things first I have moved to a new role and one week down I am already loving it. It was an incredibly hard decision to make and I have even gone for a sector I haven’t had that much experience in but tech is tech and the way the cloud is accelerating things I thought there was no harm. I have left what others would describe as a very comfortable (yet busy) life at Commercial and started to work for one of the UKs biggest green energy suppliers Ecotricity. Commercial were a great company but Ecotricity have some amazing projects lined up some of which I have some experience in and some where I really feel I can push myself onto the next level. I am also hoping that this can elevate and expose me to more architecture decisions so that I can learn from them and of course gain experience so I can take that movement from engineer to architect. I have also recently had my first NTC (Nutanix Technology Champion) call after being selected as a candidate late 2017. After the role change I have found some more time for the lab again and I now have my first 3 node Nutanix cluster running alongside the rest of my stuff. I will be writing an NTC post very shortly. I am also super excited that VMware on AWS is coming to Europe soon so hoping I can get on a workshop on it this year and this along with AWS and Azure of course. I then want to see if I can tie all these and Nutanix together somehow and lets not forget about Oracle & Ravello. I know myself and the team and also hoping to make a some more podcasts for OpenTechCast and I know I have a few things to do for the lab including a Xeon upgrade once I can find a suitable motherboard. If you have any ideas for the podcast do reach out! Of late I have been a little behind with blogging due to a few bush fires sidelining me during projects and the recent weather in the UK but I really wanted to get this post out along with a few others over the next few days. I was lucky enough to be invited to not only one but two TechUG meetings and drove some discussions there. I tried to keep this as interactive as possible and after the first live demo success I re ran my home lab slides. If you wanted my slides from that day they are here don’t forget your books! But the most interesting bit was I decided to live demo of VRDCEX and each time it went fairly well. This is an absolutely awesome project and can’t wait to see it grow. I certainly don’t match up to Alan or Pat’s delivery but I think I will get better with practise. The next big thing for me is now that I have this going on the Oculus I want to see if I can I get this going on my HP Mixed Reality Headset and then where can I further expand on this. Can I get APIs on here for switches and firewalls etc and then produce smoke coming out of them if they are broken! Again with mixed reality can I look at the server and then expand it out!!! Firstly I have to put out a major thanks to Rubrik for making this possible by selecting me as their competition winner. They are a great bunch of people and it was amazing to meet them in person at long last. I know I will be covering this in a podcast I am doing on conference differences but America does it way bigger than us in Europe. Plan Plan and then unplan – It is key to book sessions that are a must for you like I am doing NSX and VMware on AWS but book other interesting sessions and make as many as you can. Community – This leads me in nicely to the community stuff. Do you see the VMTN guys and also get involved in the collaborative events such as the Hackathon. I will be writing a post about this once I have done it tonight. Community is key and make our whole ecosystem so vibrant and there are some many interesting people to meet and learn from. Power – Make sure you have adaptors and power packs…. You will need them! If you don’t have one there is always someone giving them away and go try and get one. I have just finished my 1st few session of the day on AWS and again this is a really interesting technology. Not having to worry about rack and stacking or even running things at 80% + as well because host failures will only take a few hours till they are fixed and are no longer your issue. Firstly I just wanted to open this up and thank John, Kat, Amy, Oracle and Ravello for selecting me as a delegate for this event. I thoroughly enjoyed it and I certainly hope we can stay engaged and make it to the next one. I certainly hope this is many more events to come. The main point I want to make even if you don’t read all this and subsequent posts is that wow Oracle is back in the game. I know like many I did not know what to expect out of the day but I am glad about the way Oracle/Ravello handled the day and it’s certainly put Oracle back on my roadmap. I feel they are really bringing something to the cloud table and yes this is not a one size fits all but I can see why they have chosen to do things the way they have. For me being able to have the Oracle support and the cost/flexibility of running up a baremetal machine like a cloud server is great! I also love they fact as they put it this was a good, bad and/or ugly warts and all session of which they wanted our feedback. It was great to see a vendor willing to engage with the community and even offer us a chance to say no that’s not a good idea and take it on board as you could clearly see they wanted to be transparent to allow the product to grow in the right direction. 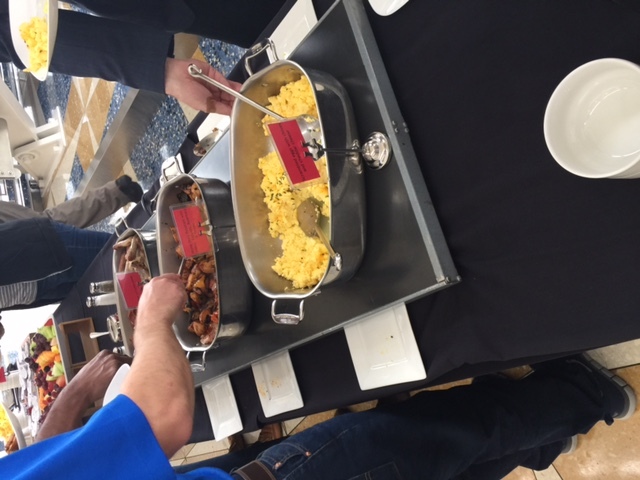 The day was kicked off by a good breakfast and we were provided time to network around our table and get to know one another. At this point he handed the baton over to Navin Thadani and he at long last let us know why the industry felt they had gone quiet. Their first objective was to tackle integration the 2nd was product development. I felt this helped put all our minds at rest and set the tone for the day. 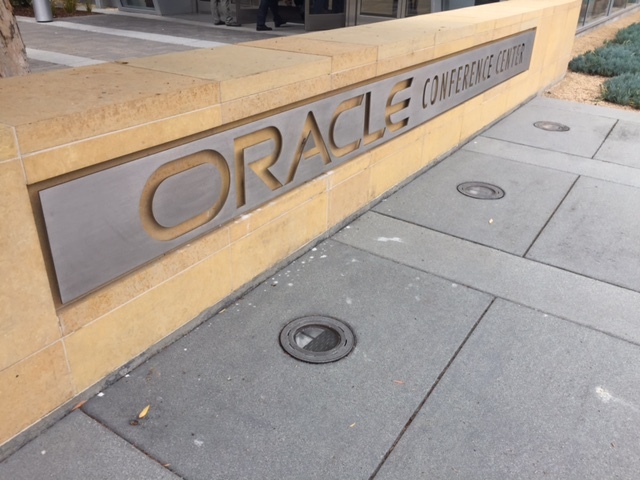 Clay Magouyrk was then up and started to cover off Oracle’s cloud vision and how they are looking to execute this. He covered off their background and how Software as a service is not new to them, they have been at this for 10+ years. The main driver for all this was customer integrations and customers wanting to modify the software. Eventually, restrictions started to stop the users flexibility so things needed to change. Because of this Oracle took a step back and started up Clay’s team as they wanted to go into this for the long game. This is where the 2nd generation cloud came in and they started to work on the limitations of each of the already existing systems in their portfolio. Everything was started from the ground up even down to people, systems, infrastructure and networking. Here come the acronyms now though…. There is now High Available zones and Domains. Their spin on zones is a DC within a region of which I feel is a much easier way of understanding this. The network in their instance is that it’s not oversubscribed along with off box networking virtualisation to allow the customer to manage theses aspects. The nice thing here they noted is none of this management is running on the compute nodes thus it will not affect any performance. The key thing this allows is that them to run is baremetals systems so it’s possible to have full root access to the compute node (apart from ILOM) to integrate into the rest of your stack. It then also allows intergrations with other devices such as F5s and other nodes that can be plugged in but still managed. They also support direct connections with cross connects and VPN to gain access to these networks along with load balancing. I dont have pricing to hand but I know transit is by far one of the most expensive components of the Cloud of which ties you know. This is one thing they want to change so that you have choice. They have shown us some very attractive offerings and once these are published I will share them as they are a breath of fresh air in our industry. To ensure all this all works there are redundant links between that data centres of which work in opposite paths. This does mean the minimum buy-in is always two ie 2 VPN or MPLS connections into each availability domain. The key thing is this needs to scale and no matter what a DC can always lose connectivity. The next slide showed us why we were all there, the Ravello integration. My only issue with this slide and it says great for X but again it can also be great for Production usage with the right architecture. I feel they really missed this punch line but didnt expand and offer this message throughour the rest of the day. To follow up from this we started to cover the cloud table stakes. I think this summarizes many organisations plus and pain points really well. Next Clay highlighted the main points, Uncompromised security such as covering physical isolation, high-security network, segregated zones and audits along with governance and control ensuring separate production/test/dev and separate IT and Dev responsibilities. The next part was quite exciting for me which is the bare metal solution. In essence, they don’t care what you run on here it could be VMware, Microsoft, Citrix etc but for me, this is a great idea. At the moment it’s great putting apps in the cloud but this way you could host VDIs close to the app to prevent data ingress charges or even old CRM or Backoffice packages to reduce your latency but it takes away they headache of managing a data centre and the other bits that go with it. At this stage I did ask about a London DC ws on their roadmap somewhat selfishly but I have been advised they hope this is coming very late in 2017 to expand on from Frankfurt. The slides then went off with some NDA stuff of which when I can share I will but it all very excting things. At this point I am going to stop this post as I feel the other topics deserve posts of their own with what is coming up, a deep dive on HVX and the Ravello roadmap as it currently stands. But overall the day was great and I cannot wait for the next one and what they team will share with us over the coming weeks so watch this space. As always I must put these view are my own and may not necessarily be that of my employer or hosts of the event. The following was intended to outline Oracles general product direction. It is intended for information purposes only, and may not be incorporated into any contract. It is not a commitment to deliver any material, code, or functionality, and should not be relied upon in making purchasing decisions. The development, release, and timing of any features or functionality described for Oracle’s products remains at the sole discretion of Oracle.